Review: What are you capable of? 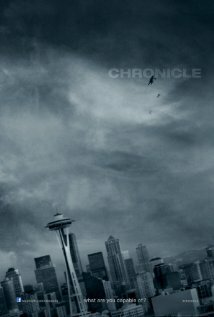 Chronicle tells the story of 3 high school kids given amazing powers. From the first day i saw the trailer for this film i knew it would be absolutely amazing. And a few months later my mind hasn't changed. The amazing superhero and found footage concept makes this film one of the most unique in its genre. The idea of the film all being recorded on a hand-held camera makes the movie the most believable I've ever seen and in an age where one can record there own life wherever is one of the best ideas for a film, much like that of cloverfield etc. But the most amazing thing about this whole movie is how original the story is and how well the characters are played. This isn't a simple good guys verse bad guys, this whole film revolves around these 3 characters who at first use there powers as jokes but learn that they are becoming dangerous. I would definitely recommend this film to anyone who wants to watch a true masterpiece. I hope that chronicle becomes a huge franchise in the coming years and on a final note i will say that this is my all time favourite film. I very much recommend it to be watched.